Deputy Mayor demands fines for gallery hosting 'Breaking the Silence', other radical groups breaching municipality contract. 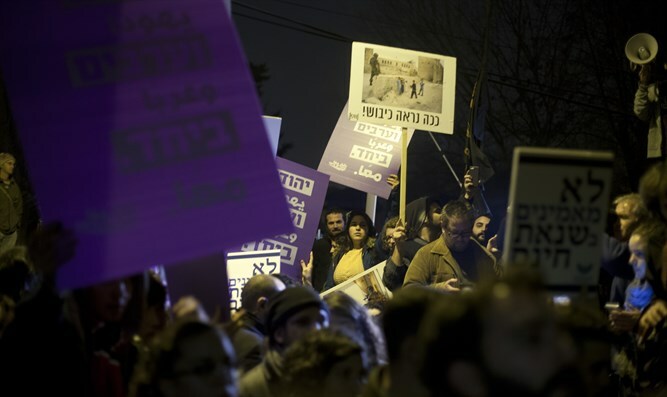 Deputy Mayor of Jerusalem Dov Kalmanovich is continuing the struggle against the Barbur Gallery in the city, which recently held a political event under the auspices of the anti-IDF "Breaking the Silence" organization. In a letter sent to the Jerusalem Municipality's legal council, Mr. Eli Malka, Kalmanovich demanded "that the city's legal department take additional measures, including imposing fines against the Barbur Gallery, and taking action to end prohibited use of a municipal structure." Asked by Arutz Sheva whether ongoing involvement with gallery happenings, and with that this particular political event, does not award the gallery free publicity, as news and satire programs cover the gallery when it's doubtful whether anyone heard of it before, Kalmanovich agreed that this may indeed be the case. However, he added, "it does not mean we need to be silent." Kalmanovich declared that action must be ethical, and since the gallery breaches its signed agreement as to the nature of the events it holds in a publicly owned building, action must be taken to stop it. Kalmanovich says that the gallery has held events for organizations such as Zochrot and "V 15", which "raises money from abroad to subvert Israeli society", and "Breaking the Silence", which, according to Kalmanovich is an organization "whose raison d'etre is to disrupt Israeli social life, to damage our very human fabric, because when they harm the IDF and denigrate the IDF's ethical values, the social fabric of Israeli Jews is impaired and the end result is exactly what a terrorist organization, which launches missiles against us and seeks to disrupt civilian life, wants to do. So it is not physical but it is spiritual. This is not an organization preaching freedom of expression, as they present it, but an organization that damages democracy". Kalmanovich further charges that "Breaking the Silence" commits "intellectual terrorism against Israeli society, because disrupting the IDF's morality is the motto of this organization, meaning it interferes with the national consensus to stand behind the IDF". Kalmanovich rejects the organization's argument that its purpose is concern for the IDF and unsullied dealings with the Palestinians, offering as evidence the involvement of soldiers serving in the organization. He said "they repeat this mantra all the time, but it does not purify a rat. This is a matter of national consensus, from the Prime Minister, who reprimanded those who met with them, to the Education Minister, who prevents them from speaking in schools. This is not about freedom of expression and democracy. This is antisocial subversion which interferes with our lives and we must comprehend the depths of the crisis they are trying to precipitate. It is not like left-wing organizations working for Arabs and seemingly for human rights; this is an organization working to damage life and society in Israel. Much worse than other organizations." A closure order for another 90 days has been issued to the gallery, but during that time it continues to serve left-wing organizations that pass through its gates, "and I think the Attorney General should fine them for every event in breach of the agreement with the municipality, and act to at least stop the illegal activity. It is inconceivable that a person acts illegally, takes advantage of legal immunity, and continues violating the law." For comparison, Kalmanovich says that "the municipality usually acts immediately, but here they gave 90 days, I do not know why. But even if you give someone a hearing before issuing a demolition order, he stops building until the hearing. What they're doing here is continuing construction after the demolition order." Kalmanovich concludes, "I say with complete certainty - this gallery will not close. They will appeal to the municipal courts, to the District Court, the Supreme Court, and they will also go to The Hague..."